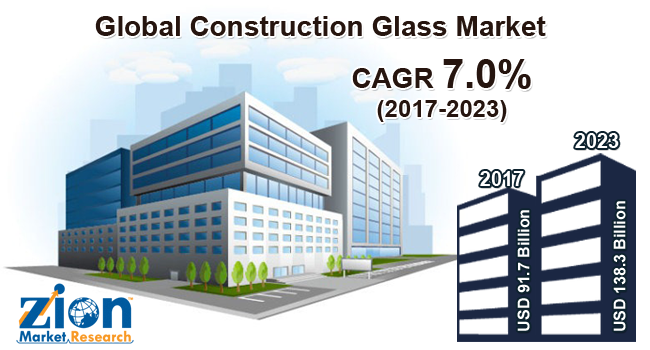 With the presence of a large pool of participants, the global construction glass market is displaying a highly competitive business landscape, finds a new research report by Zion Market Research (ZMR). Saint-Gobain S.A., PPG Industries, Guardian Industries, Asahi Glass, Sisecam Group, Schott AG, China Glass Holdings Limited, Central Glass Company Ltd, and Nippon Sheet Glass Company Limited are some of the key vendors of construction glass across the world. These players are focusing aggressively on innovation, as well as on including advanced technologies in their existing products. Over the coming years, they are also expected to take up partnerships and mergers and acquisitions as their key strategy for business development states the construction glass market study. Citing an instance, in July 2018, new Minneapolis city office construction is predicted to have bird-safe glass. Reportedly, the strategic decision is based on sending welcoming & transparent messages to visitors. As estimated in this report, the global construction glass market earnings stood at US$ 91.7 billion in 2017. Witnessing a tremendous rise during the period from 2017 to 2023, the revenue in this construction glass market is expected to reach US$ 138.3 billion by the end of the forecast period. The main types available in this construction glass market are insulated glaze units, glass wool, glass blocks, toughened glass, tinted glass, chromatic glass, extra clean glass, laminated glass, shatterproof glass, and float glass. Among them, the demand for chromatic glass is relatively higher and the trend is anticipated to remain so over the next few years, notes the research report. “Beneficial features such as ecological sustainability, security, and safety are forecast to bolster the growth of construction glass market during the forecast timeframe,” says the author of this study. Apart from this, the product is more preferred over conventional building materials such as wood, bricks, and polycarbonate owing to its cost-effective nature, thereby driving the growth of construction glass market in the near future. In addition, massive applications of the product in residential and non-residential sectors are likely to impel construction glass market in the coming years. Low emissivity of the product leading to reduced GHG emissions and energy conservation are expected to instigate the growth of construction glass market in the ensuing years. High raw material costs and economic decline witnessed in particular regions, however, is likely to inhibit the expansion of construction glass market over the forthcoming years. Regionally, Asia Pacific has been leading the worldwide construction glass market and is anticipated to continue on the dominant position in the years to come, states the construction glass market study. Rapid industrialization and strict government enforcement pertaining to energy –efficient infrastructural & construction activities are the key factors behind the dominance of the Asia Pacific construction glass market. The high number of market players being headquartered in the Asia Pacific is another significant factor that is supporting the growth of this regional construction glass market. The rise in the number of skyscrapers in Dubai and other Gulf nations are anticipated to make significant contributions towards APAC construction glass market revenue over the years ahead. Furthermore, thriving tourism activities leading towards attractive glass constructions to obstruct the intensity of UV radiations in the buildings is predicted to stimulate the expansion of construction glass market in APAC.